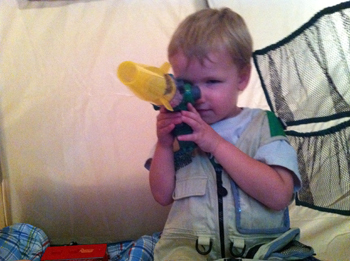 Backyard Safari Review – An Adventure Awaits (Indoors or Out)! Those that know me well, or probably even a little bit, know I’m not much of an outdoorsy kind of girl. I know with having two boys I’m probably destined to become one, but living in Texas with triple-digit weather doesn’t help for now. The boys love to play outside already, and in the spring and fall it’s easy to head to the park or spend time in the backyard. Right now, though, it stays in the 90’s until late in the evening (case in point: it’s after 10pm here and it’s 92). That means we’re getting a lot more indoor play time, and sometimes it gets hard to stay creative. 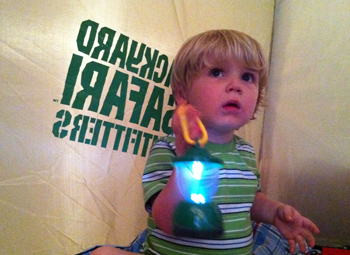 That’s where Backyard Safari Outfitters comes in to play. We recently got the chance to review some of the BSO line – a base camp shelter, camouflage netting, a lantern, two bug vacuums (one with a laser light), a cargo vest, and a hiking stick. Seriously, a fun batch of gear! J was SO excited watching me open the package that he was literally jumping up and down as I pulled each item out. 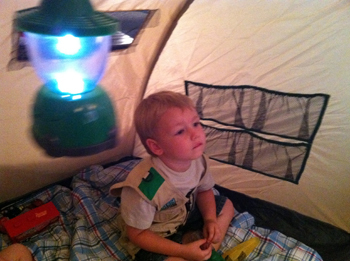 Since it’s so hot out right now, we set the boys up with an indoor camp site and they had an absolute blast. The shelter in itself is really great. 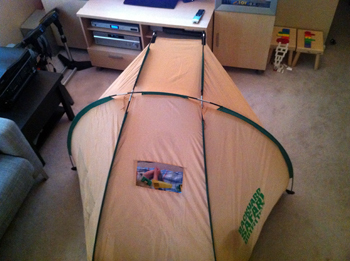 It’s almost like a tent, but is open in the front with a little bit of an extended canopy overhead. It’s sturdy and efficient, with hooks to hang a lantern from, pockets to store other gear in, and a mesh screen to see what’s behind you. 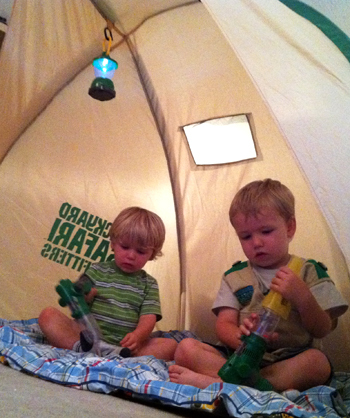 As you can see, the boys were also quite enamored with the bug vacuums. These are great – there’s a clear chamber with a magnifying piece on one end, so once you capture a specimen you can examine it. I love that the vacuums are a fun and educational piece of equipment. They encourage kids to not just be out in nature but to interact with it and learn about it – how great is that? You can see in the last two photos above that J is wearing his cargo vest. It’s chock full of pockets and hooks so you can store everything you need right there with you, including field guides that come with each product. Items also come with iron-on patches, letting kids earn achievements and be rewarded. 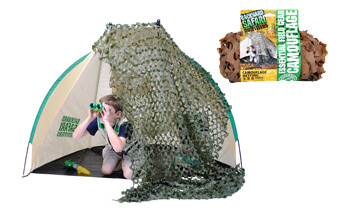 We also received camouflage netting to throw over the front of the base camp, but at this age the boys really liked having the openness of the base camp as it was. I know as they get older they’ll really enjoy having that to add another element to their adventures. 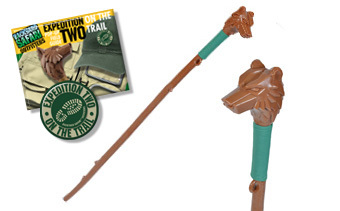 The hiking stick was a hit too, but more in the sense of, “Wow, this is a cool hiking stick… Oh, whoops, I swung this around and hit my little brother in the head with it! Whoops, I knocked the laundry off the dining table!” In all seriousness this stick is incredibly well-made and solid. The carved head brings a cool factor to it and I know the boys will love having this as they get older. And taller. 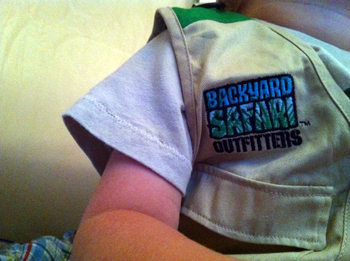 I seriously can’t gush enough about the Backyard Safari Outfitters products. They’re items that your children can truly use out in nature, but they’re also perfect for imagining an adventure right in your own living room. They’re things that will be used for years, that your kids can grow with. I love the potential for the gear to foster curiosity and imagination, and I’m so glad we got the chance to experience the gear for ourselves. 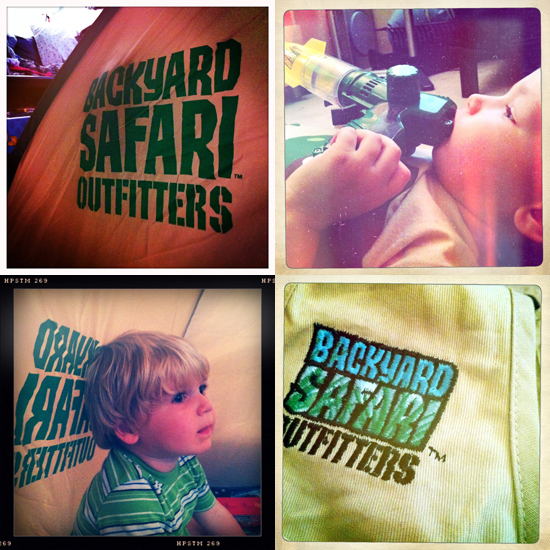 You can find the Backyard Safari Outfitters products online at Amazon or at the Summit online store. You can also find them at Toys R Us, Walmart, Barnes and Noble and Target. Follow BSO on Facebook and Twitter to keep up with any new gear that’s released! 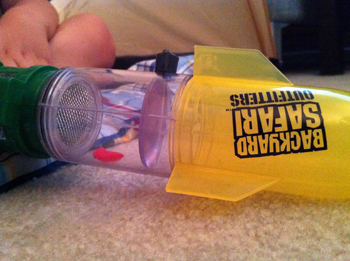 Note: I received information and products that from Summit Toys in conjunction with my membership in Team Mom. I was not compensated monetarily. Any opinions are honest and are those of myself and my family. 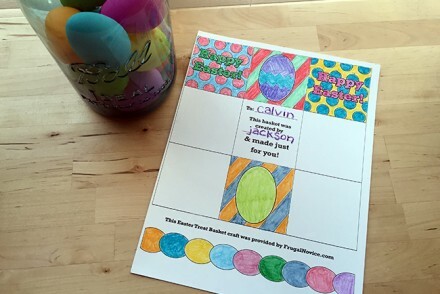 Free Easter Basket Craft – Printable Download!